When I decided to start running again in 2006, I would just go out on runs and have no idea how many miles I was logging in. Then I started going to the USA Track and Field website and jotting my routes. I started to pre-plan my runs in order to mentally prepare myself for the runs. Unfortunately it wouldn't tell me what my pace was, how long my runs where taking, or how many calories I was burning. Then a fellow runner opened my eyes to certain phone apps that could help me with tracking my miles. Modern technology at its finest! Now these worked for awhile. They were great but I really wanted to know my pace at all times. With these apps I wouldn't find out until the end of my run. If I really wanted to know while running I would have to stop, take my phone out of my arm band, and check my pace. Kind of defeated the purpose if I had to stop. After a few years I decided it was time to invest in a running watch. 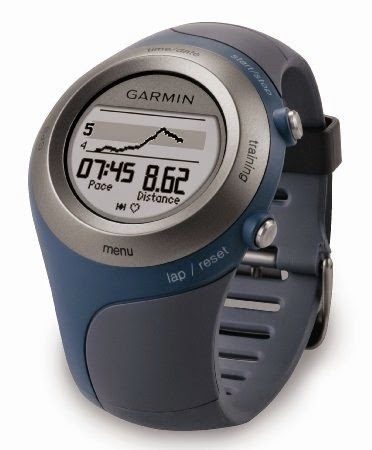 I googled "what's the best running watch" and Garmin kept popping up. I started off with a lower model (which isn't even made anymore) that didn't even have GPS. It used a footpod to track my miles. I would place the footpod on one of my shoes and hit the pavement. I purchased this watch at an Expo for a marathon race and got a good deal so I figured why not!?! Loved it! It did exactly what I wanted and then after my runs I could transfer all my info with the ANT+ USB stick it came with. It wirelessly connected my watch to my computer and kept track of my routes, pace, mileage, and calories burned. Wearing the heart rate monitor was how it tracked my calories burned. The strap wasn't very comfortable so I didn't wear it that often. Eventually my battery needed to be replaced and then the armband broke. So I just retired my watch and returned back to my trusty phone apps until my next watch purchase. Luckily my birthday was coming up and my boyfriend (now husband) purchased one for me. Winning!! He got me the Garmin FR405. Once again this phone is no longer made but can still be purchased on Amazon. This watch is also wireless but contains GPS. No more footpod! The best thing about this watch is that it is rechargeable! On normal watch mode the battery can last about a month. When I am constantly running using the GPS, it last about 2 weeks. I usually just let it charge right before a long run just to be on the safe side. It also comes with the ANT+ USB stick, extra arm bands, and another heart rate monitor. Just like my other watch though, I don't use it as often because it chafes my skin. Right before a run I have to link my watch to the satellites in order for the GPS to work. I sometimes look kind of dorky waving my wrist in the air searching for a signal...the things you do for running. This watch can be used for other activities not just running. I have't used them but it is nice to know that I have options. It also has different training runs for running that have helped me drop my mile time. Overall I absolutely love my watch! I highly recommend Garmin for running watches but there are other watches that do the same. Prices will very from and can cost as high as $399. Luckily there are many options that fit every runner. 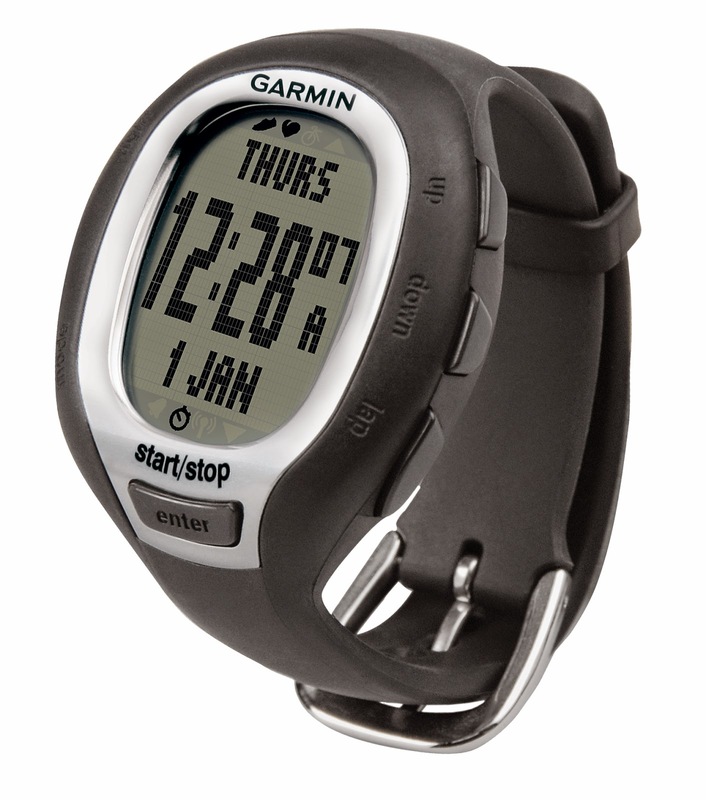 My current watch does exactly what I need it to do, but I am keeping my eye on some of the newer Garmin models. Christmas is right around the corner which means it is a perfect time for an upgrade. Or for you runners that don't have one yet, perfect time to put it on your wish list. Do you own a running watch? What brand/model do you use?